In bowl, mix mayonnaise, cucumber and 1 tablespoon of the honey. Cover; refrigerate until needed. In 10-inch skillet, heat oil over medium-high heat until hot. Add chicken; cook, stirring frequently, 6 to 8 minutes or until chicken is no longer pink in center. Stir in salsa remaining 1 tablespoon honey and the cayenne. Reduce heat to medium-low; simmer, stirring occasionally, 5 minutes or until flavors are blended. Stack 4 of the tortillas in microwave oven. Microwave on High, 20 to 30 seconds or until warm and pliable. Repeat with remaining 4 tortillas. 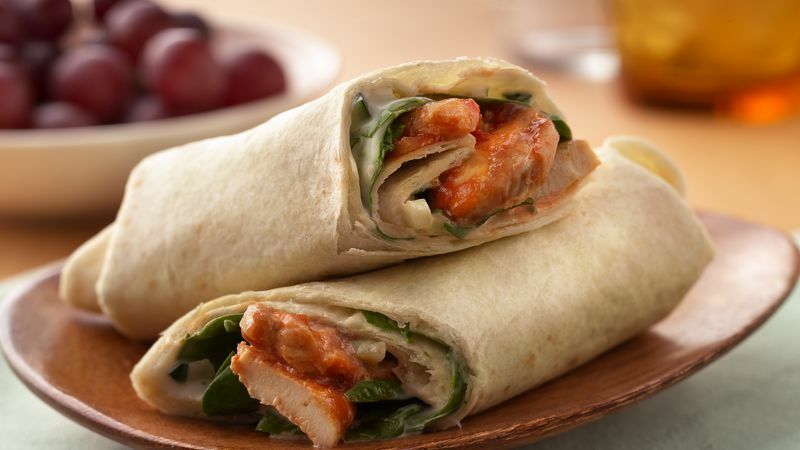 Spread each tortilla with 1 tablespoon of the mayonnaise mixture; layer with 1/2 cup loosely packed spinach leaves and 1/3 cup of the chicken mixture. Roll up tortilla; cut diagonally in half.